The weakest road users are particularly vulnerable in autumn and winter. Twilight, darkness, and fog, paired with dark clothes, harbor a great danger in traffic. It is important, so the primary school authority Frauenfeld in a message that the schoolchildren are clearly visible in the road. Only those who wear reflective clothing or accessories can be recognized early on by other road users. This safety precaution has been met with the kindergarten children and first graders for quite some time. The children would be stopped to wear the orange and yellow light stripes. The experience made with that and the feedback from many motorists was positive. So positive that the school board introduces the duty of wearing a luminous vest. This is valid from autumn to spring holidays for all children from kindergarten to sixth grade. The aim of the light wears wearing is to improve the safety of children on the way to school. The responsibility for the way to school lies with the parents. “Knowing this, we ask the parents to stop their children wearing the vests with reflective materials,” writes the Primary School Board. The kindergarten teachers should continue to wear the orange vest. This gives the police from his visit to the kindergarten to the children. While in the summer half-year for the children of the kindergarten and the 1st and 2nd class the carrying of the light strip is compulsory. 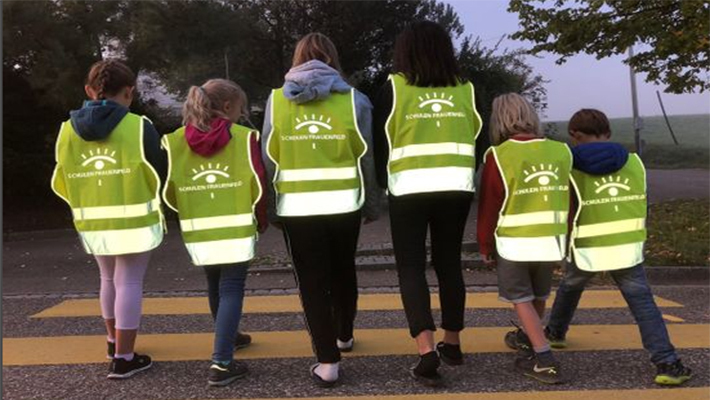 The Cantonal Police Thurgau also wants to contribute to the protection of pedestrians with its annual campaign “Security through Visibility”. The subject “Watched by the pedestrian strip” is adorned with the newly illuminated waistbands, which will be handed over to school children free of charge again this year. The subject should refer to the regulations and recommendations before and when entering a pedestrian strip. Especially the rule “wait – liege – loses – run”. For ten years, the luminous vest can be ordered through the schools. Again, more than five thousand will be available for free this year. With this action, the safety of children is improved by better visibility, especially in bad weather and darkness. The luminous vest is designed by the Thurgau artist Max Bettina. The campaign, which lasts until the end of March 2019, will be financed from the fund of the ticket inspection auction of the Road Traffic Office. To create an additional incentive to wear the luminous vest, they are equipped with a Talon. Anyone who wears the reflective vest and meets a policewoman in the street can hand it over and take part in a raffle of fifty tablets.